Eureka Seven is one of my favorite anime ever, Eureka is one of my favorite characters ever in a show full of incredible characters, and I consider the pacing of the show to be among the best I’ve ever seen. It’s a tough act to live up to, and so with the new Eureka Seven AO currently running in Japan, I wanted to at least give it more than one episode before I started talking about it. Not that I thought that the first episode was bad and needed a second one to “give it a chance,” but my experience with the original told me that this may very well be a show which continually ramps up and whose threads (plot, thematic, or otherwise) are only barely visible in the beginning. To cut straight to the chase, the main character Ao is clearly implied to be Eureka and Renton’s son. As a result, I feel like Ao inevitably draws comparisons to Renton, but also that the show obviously wants you to do so. 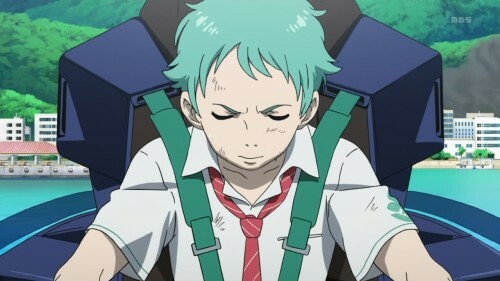 The first episode of the original Eureka Seven was all about how Renton wanted to escape his boring, do-nothing town and join the fabulous rebels of Gekkostate, whereas Ao has to deal with the constant materialization of skub coral and the destruction it causes. On top of that, both have parents whose legacies at first seem larger than them, with Renton’s father Adrock being regarded as the greatest hero who ever lived and Ao having to cope with the fact that even mentioning his mother and her turquoise hair on the island garners animosity. The difference between the overbearingly positive reputation that Renton had to deal with and the overwhelmingly negative one that Ao must live with draws an additional interesting parallel, but I feel like it does so while making Ao seem like his own character. It also doesn’t hurt that Ao’s relationship with his friend Naru is distinctly different from Eureka and Renton’s. 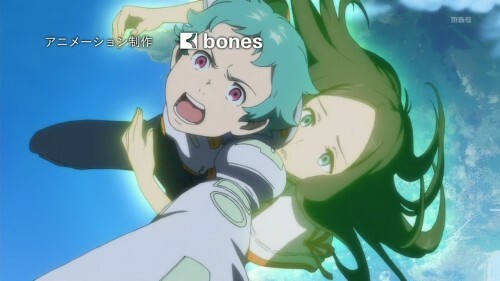 It seems to be built on this strong friendship which goes beyond the immediate conventions of the island where they live, and I actually have it in my mind to judge anything related to Eureka Seven based primarily on how it handles its main romance. 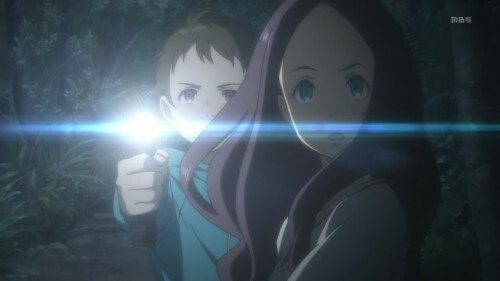 The reason is that when Eureka Seven was originally airing, during the breaks there would be commercials for the Eureka Seven: New Wave PS2 game where the slogan for the game was “Another Boy Meets Girl.” This of course implies that Renton and Eureka were themselves a “boy meets girl” story, and the fact that their romance was so unbelievably strong supporter that concept. In that respect, and many others, I continue to look forward to Eureka Seven AO. No guarantees it won’t wipe out (see what I did there), but I feel like it’s definitely off to a strong start.